Clara and I were spending a few days at Stephen F. Austin State Park and while there we visited the nearby and the recently opened San Felipe de Austin State Historic Site Museum. While there, one of the museum staff employees recommended Ermis Double E Grocery as a good place to eat. She was not wrong. The next day at lunch we drove down FM 1458 from our campsite to Ermis Double E Grocery. 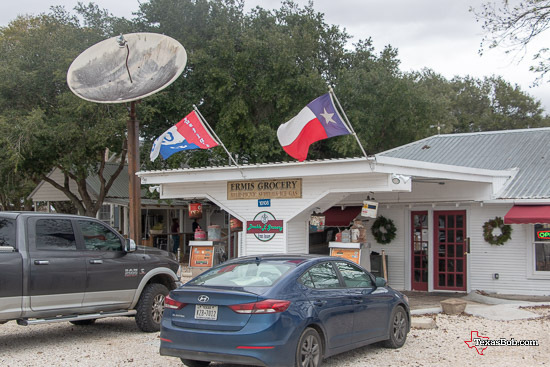 Ermis Double E Grocery is located two miles south of Interstate 10 on FM 1458. Just take Interstate 10, either east from Sealy or west from Brooshire and take exit number 730. That is the FM 1458. Then go south on FM 1458 two miles and you are there. Check the Map Link badge on the left for more detailed information. At "Ermis Double E" the menu is varied with many unique items such as "special blend of ground meats by Bellville Meat Market" used for their burgers, "Pickle Bombs" and house made pickled purple onions. Did I mention that they have Bluebell Ice Cream? Clara order the soup of the day, which was a Poblano Soup. I had a Burger with mushrooms, swiss cheese and that "special blend of ground meats" and what they call "extra crispy fries. It was all good. Services was good and the prices were reasonable. I have no trouble saying that Ermis Double E Grocery has the best burgers in Frydek, Texas. 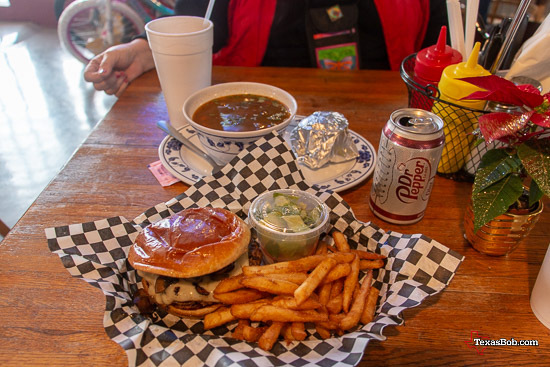 I could also say that Ermis Double E Grocery is the best place to eat in Frydek, Texas, even if it is the only place to eat in Frydek, Texas.